While the Asa Wright Nature Centre was not included in any visit or activity during the recent Commonwealth Heads of Government Meeting (CHOGM) held in Port of Spain, this did not prevent persons from coming to visit Spring Hill on their own initiative. Nobel Laureate Professor Joseph Stiglitz, who was the keynote speaker at the CHOGM Business Forum, is an avid bird watcher and nature enthusiast. He arrived in Trinidad ahead of the Forum so that he could fulfil a long-held dream – to visit the Asa Wright Nature Centre. He spent two nights at the Centre, enjoying the nature trails and visiting the very rare Oil Birds in Dunstan’s Cave. Chairman Dr. Carol James came up to join Professor Stiglitz for lunch, along with UWI Economics Professors Dr. Patrick Watson and Winston Dookeran. In his speech to the Business Forum, professor Stiglitz emphasised the economic importance of the environment and atmosphere to our livelihood on Planet Earth. We also enjoyed a visit by the Prime Minister of Sri Lanka, Mr. Ratnasiri Wickremanayake and his party. The Sri Lankans marvelled at the similarities between our Northern Range forests and the interior of their country. 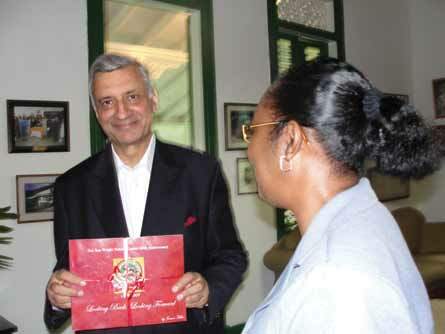 Then the Commonwealth Secretary General, His Excellency Mr. Kamalesh Sharma and his wife Babba arrived for lunch and a short visit on their last day in Trinidad. They were ecstatic to conclude their busy visit to Trinidad in such beautiful and serene surroundings, promising to return and stay a few days to walk the trails and visit the Oil Birds. Other than their enjoyment of the Spring Hill experience, all of these visitors expressed one serious concern for the Centre – and that is the ever-increasing scars on the hillsides viewed from our famous verandah. As the ongoing quarrying operations move closer and closer to Dunstan’s Oil Bird Cave, we must do all that we can to protect and prevent further disruption in the life of this rare and precious bird species.